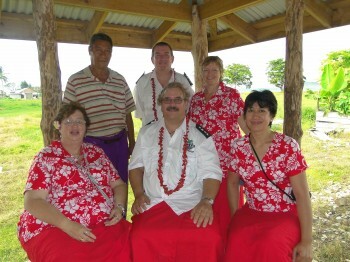 This post is about three people who really make life worth living here in Samoa, and me! It is rare for me to be out of the office without the SWAP uniform. Wearing it at all times goes with the territory here because we draw high attention to ourselves. It is also rare for me to be photographed, as I am almost always behind the camera snapping others. This is a rare shot taken of yours truly by one of SWAP Ambassadors Rob Spijkerman while waiting to see the PM this week. A gold signet ring that is a challenge because a few years ago it cost me probably the equivalent of an entire year’s wages for maybe 50% of the Samoan population. The trouble for me is that if I sold it and gave the money to the poor, the poor would say thanks and be poor tomorrow too, and I wouldn’t have a ring that I actually really like! Now where are those sunglasses please . . . those Palagi legs – they are white – like the sand mate – white! They are definitely not the usual dark ones here and they pretty much stand out like dog’s b*lls here – except that saying really doesn’t wash much here because those things mentioned are all over the place! The man-skirt (Red mate – red – like a fire engine and an elavalava to you) attracts a LOT of attention from the local women here. 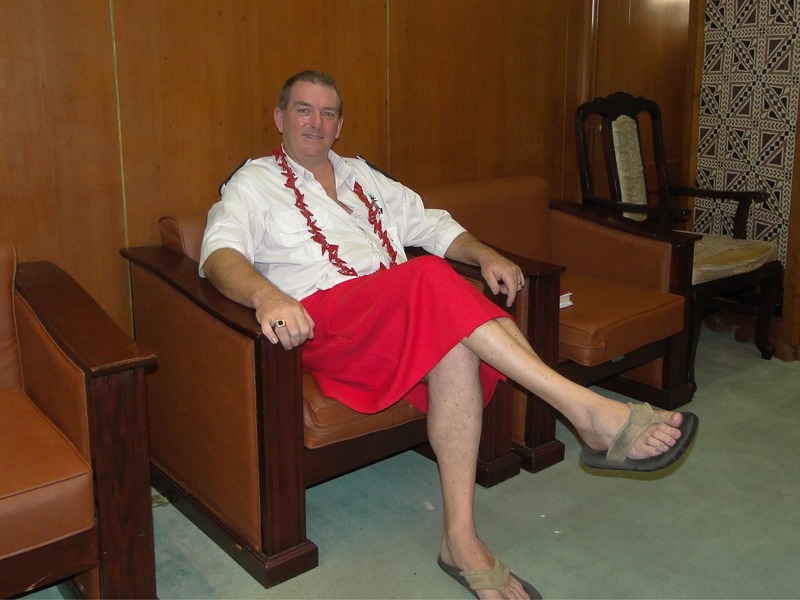 A constant stream of Samoan women (very forward they are) stop me to say – “You look nice [in that lavalava]!” and because they mean it and it means so much to them, I wear it when out and about – always. Jandals. Thongs to some. Where else in the world do you find all business meetings with bare feet and/or sandals or jandals – and from the PM down? The reason – it’s practical. In days gone by barefoot was all you needed and all you had. So why change? It’s too hot for anything else anyway. The ula. Beads or necklace to some. Just as the women always comment on the elavalava, the men always comment on the ula. “Nice ula!” they will often say. Again, they mean it, so I keep wearing it. Many times Samoan men will approach me and speak in Samoan thinking that I am a High Chief. We all laugh when I inform them that no, I’m just a Palagi pretending to be a Samoan. The epaulettes. Hard to see in this photo but visible in the others. Our uniform is seen as quite classy in this culture and it gives our people a special visual status. Wearers of our uniform carry a presence that builds on the legacy that we have built up over here. SWAP stands for something and while it is sometimes hard for a “nobody” Palagi to come over here and show off their label, the Samoan people understand a programme and respect it. Sometimes with this uniform on and walking around in Paradise I wonder if I’m a pretentious confused cross between a cross-dressing policeman and a Samoan High Chief. Other times, when people connect well and appreciate what we are doing (as I do sitting above waiting for the PM) I feel right at home – a Palagi with a vision in a foreign culture, learning the ropes but making progress to help make a difference. I adore this photo with the PM because it is one of the very few photos in which he is captured smiling. 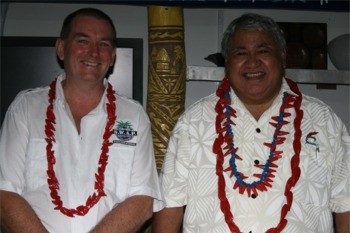 Tuila’epa is one of the most astute people I have ever met, but he is also a man with a lovely sense of humour, which also has a little mischievous side to it. I first saw this when watching the extraordinary contretemps he had with John Campbell. Knowing a little of the inside story, and communicating closely with the PM as the saga unfolded and during the public nonsense that played out, I came to see a side of the PM that is actually quite delightful. He’s got a big heart. There is no question that Debbie and I (and the SWAP Foundation) are still in Samoa as a direct result of the PM’s active support. You can’t help but like people like him eh? Joe’s one of those old-school gentlemen. He says that he has not been an angel all his life but that he’s just learned a few lessons along the way. Nicely put. I know the feeling. Joe is the ultimate diplomat, a gracious host and founder and owner of Sinalei. He is recognised as the “father of modern tourism” in Samoa and is also a big-wig – a High Chief, actually a Paramount Chief they say. But just Joe, to me. We’ll be able to help him heaps over the years ahead, particularly with filling his shoulder season and developing new business opportunities. Here he is smiling and posing with his latest guests, the SWAP team. It was nice to have a photographer and actually *BE* in the picture this time. Joe has read my book Lipstick on a Pig and loves it. Hmmmm. Possible correction? Actually Joe says that he definitely agreed with a lot of it. Maybe that’s his Samoan diplomatic way of saying something different? 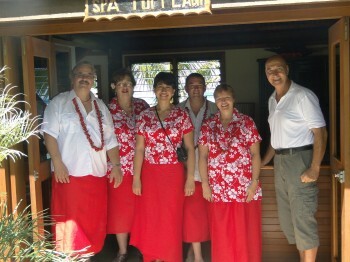 Work is hard in Samoa for the SWAP team (not!). Here is a very special moment for me, a meal prepared by a man and his family who lost their home and all their possessions in the Tsunami, and some of his family. Vaelupe is another gracious Samoan gentleman. When I first met him he was the mayor of Malaela, a village that relocated inland entirely. I asked him to prepare a “size 2 pua” (that’s roast pork to you and me) for the SWAP team and he delivered. It was an honour for him to do it and anything I wanted – he would be honoured to supply it for us. Money? “It’s up to you!” he says – and genuinely means it. 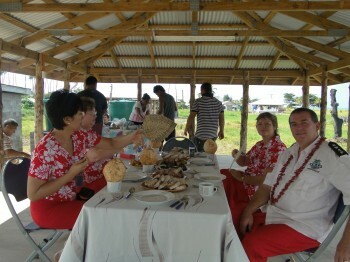 This is the SWAP team at Malaela, a new fale with the devastation from the Tsunami all cleared away in the background and greenery regrowing. Valeupe is probably an angel in disguise! When I think of the countless times that Samoans have robbed me, beaten me, lied to me, ripped me off and showed their ugly racism towards us, then when I pause and think about all the love and generosity that people like the above friends have shown me (and now us with Debbie here), tears come to my eyes. Good people are not the ones who tell me that they want to get the Missionaries to come and preach to me because they are the only religion that will go to heaven, then get angry with me and punch me over stupid little cultural niceties. Good people are not the ones who beg, borrow, lie or steal to pay the Pastor just enough so that they won’t be shamed by others giving more than them at church that Sunday. Whew . . . you could almost drop one of the “O’s” and call them “God’s people” instead, eh?